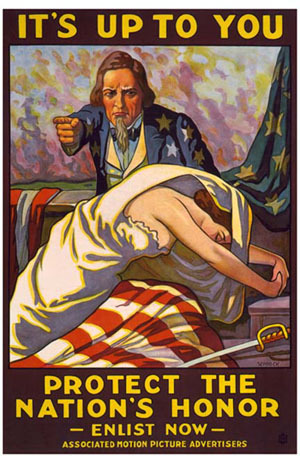 an ambiguous poster of a suspicious-looking uncle sam with the nation's "honor." looks more like it's up to you, amigo. there is a time after several days pass without posting anything on your blog when a week or so passes. and then you begin thinking "well, now if i'm going to post something it better be great to make up for my absence." you say to yourself "find some arty-looking pictures, write up one of those witty anecdotes that only you know how to write up so wittily and earn that period of unexplained absence." of course, you don't do this, and expectations go up and up. after a month and nine days this barrier is insurmountable (with or without my finals and crippling depression). instead, to simply break back in, i'm posting probably the worst post in the history of blogging just to get it out of the way. feel free to be underwhelmed*. *whelmed is a word. it means submerged.